Walking in downtown, you ask someone what time it is and the person grumbles an answer without looking up. You trip and someone snorts. You try to strike up a conversation in line at the grocery store and receive stares of horror from the other patrons, as if you have poop on your face. Living on the East Coast, sometimes it’s easy to forget what it’s like to be surrounded by bona fide nice people. But not in New Hampshire. People in New Hampshire ask how you’re doing and really want to hear the answer. If you look lost holding a map they volunteer help with directions. When you ask a question they look for an excuse to keep talking beyond the simple answer. I thought New Hampshire basically would be an extension of Boston and people in the tiny state wouldn’t have their own identity. Boy, was I wrong. The locals are so friendly it reminded me of growing up in the Midwest, where everyone talks to and goes out of their way for strangers. Upon visiting New Hampshire and immediately having positive interactions with the residents, I wondered what wonderful worm hole of friendliness I had stumbled into. Remember my Portsmouth visit, when the Nor’easter whipped through and dampened spirits? The streets understandably were devoid of people as I trudged through the pouring rain. But there were two experiences with residents that stick out as worth noting. First, a local woman in a raincoat was walking about a block ahead of me. I was walking faster than she, and eventually tried to pass her. The woman suddenly stopped and bent down right in front of me. She picked up a large construction nail and said, “Huh, better throw this in the trash. Don’t want somebody stepping on it!” I commented that I hadn’t even noticed it and she looked proud as she talked about spotting the nail and preventing it from ending up in someone’s foot or tire. She tightened her raincoat hood, marched to the trash can on the corner and threw out the nail, continuing to chat with me the entire time. I’ve certainly never come across anything like that on the streets of Washington, D.C. 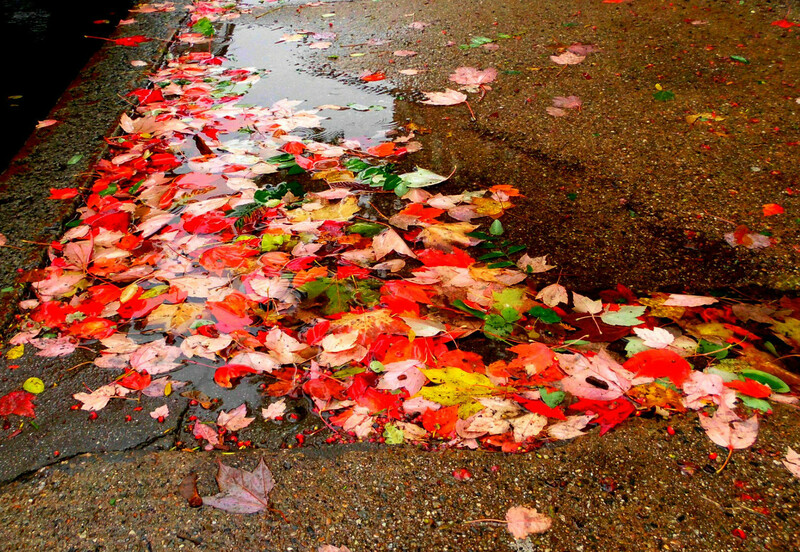 The allure of the colorful fallen leaves swimming in the puddle was too strong to pass up. I balanced my umbrella, purse and coffee while trying to snap the perfect pic. A couple of locals had walked up, apparently on their way to lunch, and paused behind me. I heard them muttering about not wanting to ruin my photo by stomping through the puddle. When I stood back up to compose myself, I thanked them, hardly believing that people would stand there in the rain just to avoid disturbing a tourist’s photo. The niceness doesn’t end at the borders of New Hampshire, it bleeds over into the entire upper Northeast. I’ve had similar experiences with friendly people in Maine and Vermont as well. This cluster of states holds a secret pocket of friendly people. They don’t remind you of their niceness like the friendly people of Minnesota, who are proud of their “Minnesota Nice” distinction and often talk about it. That’s not a bash on Minnesota because I enjoyed the people when I lived there. It’s just different. Folks in New Hampshire merely live a friendly lifestyle and let you draw your own conclusions. Friendliness in the Midwest has become so stereotypical it’s almost expected. But when it shows up in an unexpected place — like the stereotypically cold and unfriendly East Coast — it is more noteworthy. Niceness often gets overlooked but I think it’s a strong show of character. It’s a lot easier to ignore people and simply fend for yourself. But exhibiting respect for others and making an effort to be pleasant and helpful really does signal to me a person with a more developed character. It’s something I respect more as I grow older and understand more thoroughly the effort involved in such interactions. Although New Hampshire obviously isn’t the only place where genuinely nice people exist, I certainly was surprised to find the trait so widespread there. Even more than the food, incredible maple syrup and breathtaking nature, the residents of New Hampshire will keep me returning to their state for years to come. Hopefully they don’t mind that I blew their cover about the friendliness. I was just trying to be nice.